I don’t really understand why we will willingly watch things that frustrate us to the degree that your blood pressure gets so high all it makes your blood filler cap pop off. 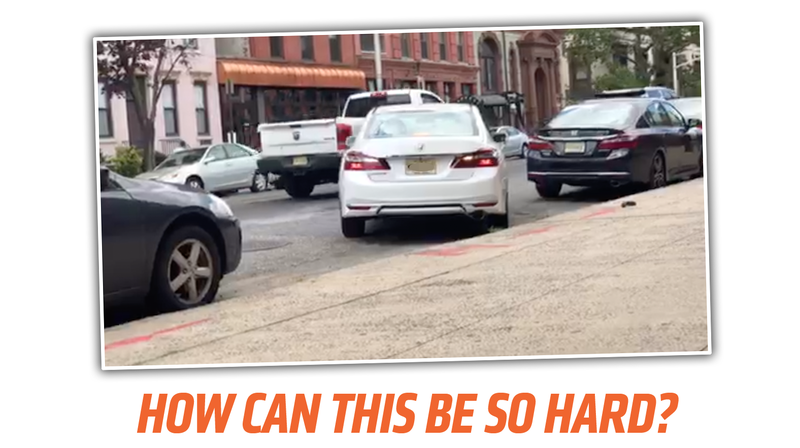 This video of a person trying to parallel park a Honda Accord into a generously-sized space is one of those things. What’s especially maddening is the nice guy that comes out to remove a can or something by the car’s tire, thinking that that must be the cause of the trouble. Oh, buddy, I wish it were just that errant can. It’s so slow and deliberate and yet so wrong that it almost hurts to watch. Daniel, the guy in Hoboken, New Jersey, who sent this to us also included a video of another person just zipping into the spot with no problem right after this, but I didn’t think it was necessary to show that because, come on, that spot is huge. Oh well. I’m sure the driver has many other things they’re good at, right?